A couple eats Kale in Metropolis for an event, until the kale causes them to become Kale monsters. As the male of the couple runs for his life, a Kalian smashes a semi and says he is guilty of sins against the Kalian race. Superman investigates as the "Wholesome Goods" team examines the scene. Meanwhile, Top Cat lazes about at his job at Wholesome Goods, pawning off his duties on a manager who then screams at him until the Kalian shows up. The Kalian claims that they've been in hiding for a long time, until people ate Kale, and now they're being killed. Top Cat sprays him with weed killer. Superman shows up and they team up. Meanwhile, on a private island, Alexander Mikos gloats about killing the Kaliens. 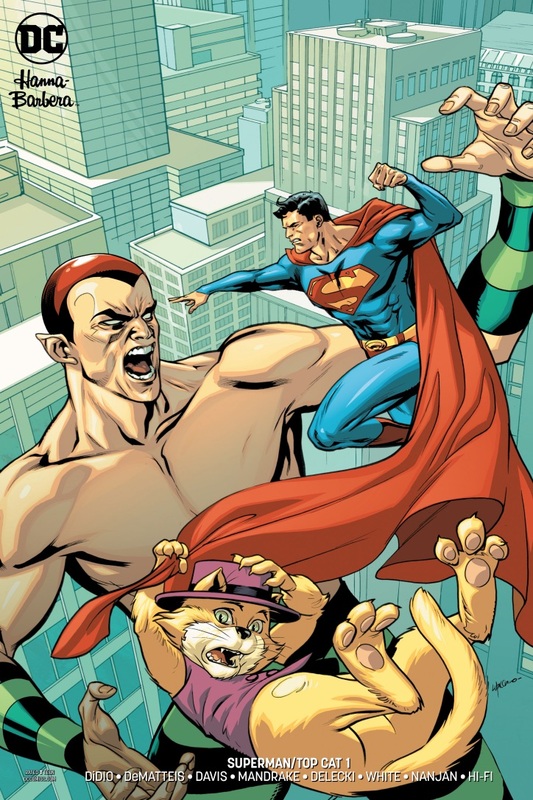 Top Cat goes to the Daily Planet and finds Clark, who he immediately recognizes as Superman. They see the Kalien is headed for Mikos. When they arrive, the Kalien attacks. Top Cat tries the drones, to little effect. Superman attacks the Kalien. 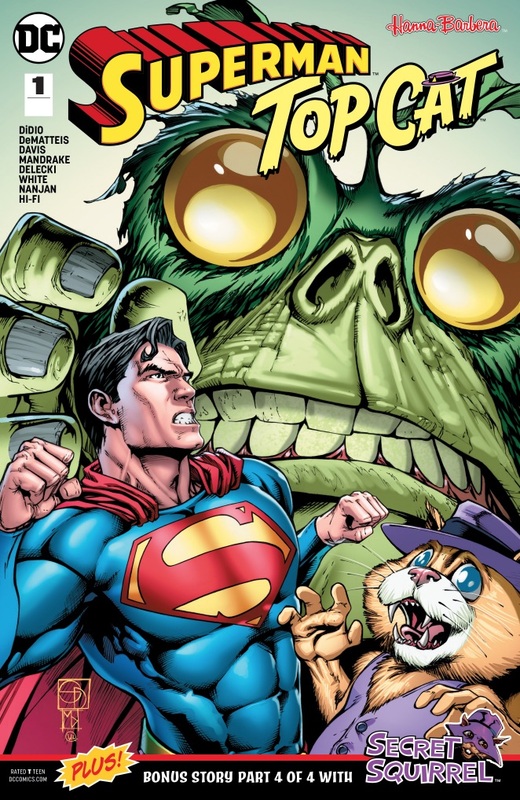 Top Cat discovers that Mikos is trying to take over other species like the Kaliens, and tells Superman. Mikos hits Top Cat and knocks him out. Mikos releases Amazo Prime to stop Superman, continuing the Amazon/Whole Foods shtick. The Kalien and Superman defeat the Amazo robot, and Top Cat knocks Mikos out. After, Superman says he can stay at the Hall of Justice. Story - 1: Zod is one week late for this review because that is how long it took Zod to stop vomiting. This comic can fairly be called a sequential story, that much can be said, but in terms of enjoyment or value of any kind, there was little. A thinly veiled bit of satire that had absolutely no creativity to it, this story surprised Zod in only one way - that its writer could be the editor of a major comic company, and still think this somehow a good or entertaining idea. Top Cat is not explained as a concept, which is a problem for anyone under fifty years of age. Mikos is an irrational concept, and not a funny one. And Superman is as blank and accepting of every situation as a computer program. Blarg. Zod would rather eat kale. Art - 3: Zod found the art colorful and interesting, though lacking in much originality. The characters were all rudimentary in their rendering, the action dull in many respects, but there was nothing functionally wrong with the work itself. It merely was. In a story like this, there is the choice to go more realistic, or to jump right into the world of Top Cat, Elmer Fudd, etc. This book tried to do both admirably, and as a result, the end product is patchy for it. Cover Art - 3: Zod is unsure of what is happening here, or why Superman is so stiff about it. But the design of the creature is fun, and the coloring is excellent. It is rather odd, and its novelty makes it more interesting than awful. Still and all, average.